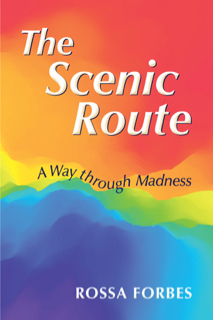 My memoir, The Scenic Route, takes you on the inevitable journey that a diagnosis of mental illness pushes you toward. You decide whether my experience with my oldest son’s descent into schizophrenia has any bearing on your life, or the direction you want your own journey to go. I hope that my book will stretch the limits of your thinking on how best to help your son or daughter, to take you somewhere well beyond the purely medical model that you will be exposed to in hospitals, doctor’s offices, and in public group think. Maybe it will fire up your imagination to act beyond the clinical approach. You’ll find the scenic route more interesting (maybe even a little bit fun) because you are scripting the journey most of the way yourself. You’ve got some control over the inputs affecting the outcome. Current treatment for schizophrenia and other mental illnesses is like a road to nowhere: Built with good intentions by professionals relying on the latest, but often contradictory, scientific thinking, it is nonetheless constructed with little to no input from the users—meaning us, both patients and parents. The Scenic Route gives you a glimpse of the benefits of taking the inevitably longer and less travelled route. (Hint: I’ve found no shortcuts to recovery.) The places we’ve been to, the people we’ve met, have deepened my appreciation of getting off the beaten path, as far away from clinical observation as possible, when possible. Chris Forbes was a second year university student in Toronto, Canada, when his increasingly strange behavior landed him in a psychiatric hospital for observation and treatment. Diagnosed with schizophrenia, he returned home to Switzerland. I started my blog in 2009, Holistic Recovery from Schizophrenia: A Mother and Son Journey. A year or two previously, “kinderelf” whom I met in a chat room, convinced me that the best way of effecting a paradigm shift in the consciousness of the general public, was to write book. If the times are right, a well told story can further a paradigm shift in thinking. I’m hoping that the time is right now. Enjoy the journey. My Son is in the same situation. He is 29, I need advise in how to get him off the awful medication. I have just started down this road after my daughter had brain surgery after a brain abscess ruptured when she was 17. I don’t know where to begin, one thing I do know I do not want her on those pills. I read this book as I am looking for holistic treatment for my cousin. Can you please advise of Dr. Elaine Erika’s whereabouts. Do you have an address or phone number for her. Does she still practice? I would truly appreciate any information you can give. I was unable to find her on the web. I am happy to know that your son is doing well. I admire your efforts in trying to get him help. Book was very well written. Thanks for the positive review. I’m sending you the information you requested to your private e-mail address. My brother is 19, suffering from psychosis since age 16 and in on anti-psychotic meds.The meds are not working for him and doctors always increase/decrease dosage or change the meds, but nothing worked him.What else can we try for him, can we try homeopathy ? I write a little bit about homeopathy in the final chapter of my book. Here’s my opinion. I doubt it will bring your brother around to fully functiong, but a good homeopath provides understanding and support at at time in his life (and yours) where few people are willing to engage with him. I was amazed how well the homeopath read my son and her remedy provided a very good clue into his personality hence it make me more tolerant of the eccentricities. Your brother can and will recover in time, with lots of family encouragement, not criticism. He needs someone to engage with, whether it is a licensed therapist, or an altnernative healer. In my experience based on a sample of one, it is good to try a variety of approaches.